This week on Spellburn we take a look at 3rd party publishers and the products that have been released for the Dungeon Crawl Classics RPG. 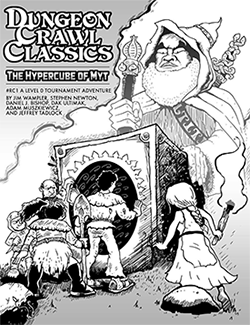 For a system only a year-and-a-hald old, there is already an enormous assemblage of efficacious adventures, supplements, and tools for use with DCC RPG – many of them free to download and use! From dungeons to patrons to alternate occupations and more, we cut a wide swath through it all in this episode. Thank you for the kind words gentlemen. Once more, an excellent podcast. Thanks for the mention. I’m glad you are enjoying our products. Oh, and if you are interested, the Patron Bond allows you to bond anyone to a patron, although that does not mean that they get to Invoke Patron. Re: 0-level demi-humans, Patron Bond, etc. In DCC, whatever the judge says the rule is, is the rule. Notes to clarify what the book says should be taken as only that, to inform your listeners, because whatever you are doing in your own games is how it works in your game. I hope I am not coming off as a rules lawyer! I really enjoy listening to your podcasts, and I hope to hear many more in the weeks to come! You aren’t coming off as a rules lawyer at all Daniel! I know my game morphs into its own take on the rules – whether from lack of clarity or simply because we’ve decided what we are doing works better for us. I think Judge Jim’s mantra of “if you are having fun, you are doing it right” is the approach each of us takes. While we may say what works for us or talk about a certain topic from one perspective, having fun is what the game is all about. (Sorry, your game morphs): As it should! Loving the podcast, venerable Judges! I was shocked to hear you mention my humble Judge Mat. Here’s a link to the PDF if anyone else wants to use it. It’s not perfect, I initially wanted to have a section for tracking initiative and for jotting down notes. It’s something I’m definitely going to go back to. Thanks for the great show! Keep it up! I found a cool website with some fan made DCC references, and other generic downloads. Some good stuff here!